The awesome and creative people over at Sweet Earth Foods (the folks that make the yummy Benevolent Bacon) recently sent me some of their breakfast sandwiches to try. I'm not the biggest consumer of pre-packaged foods, because I much prefer cooking my own, but hey, foods like this serve a purpose, and are great for new vegans, anyone in a hurry or those who can't/don't like to cook. And I definitely like to eat yummy vegan stuff and I DO get a lot of newly vegan folks asking me about this or that product and if I've tried it, so why not? Honestly, before they sent me the sandwiches, I had no idea Sweet Earth had such a huge line of products. Those of you who can get these items on a regular basis are LUCKY! I was SUPER excited when these sandwiches showed up on my doorstep and that I got to try them before they hit the markets in October. Seriously though, I DO know how many of you feel, it's a bummer NOT being able to find so many of the interesting sounding products you hear and see other bloggers casually using ALL THE TIME, it seems, on social media. OK. End of rant. In short, I was excited to get to try something NEW! 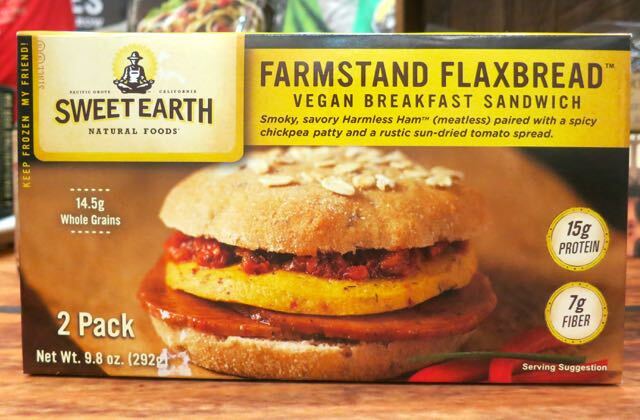 So, this vegan breakfast sandwich (they also have a vegetarian one) is officially called the Farmstand Flaxbread™ Vegan Breakfast Sandwich. 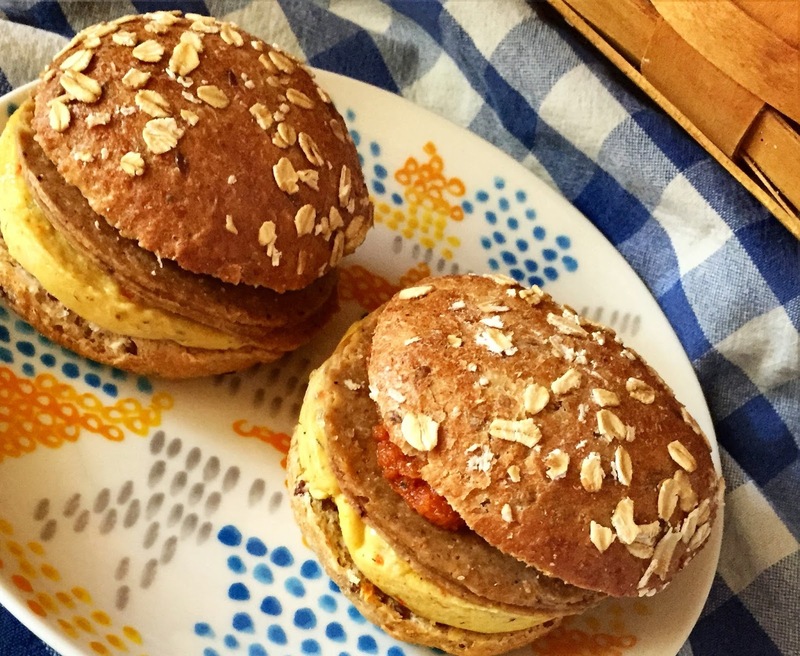 It features the company’s Benevolent Bacon, a spicy, "eggy" chickpea patty and a sun-dried tomato spread. The whole wheat bread is made with oats, oat bran, and flaxseed, and has 14.5g of whole grains per serving. The entire sandwich has 14g of protein and 6g of fiber. Pretty good for one sandwich! So, what did we think? OK, I followed the cooking directions on the package, and on my first sandwich ended up having to heat it quite a bit longer than the package said. This made the bread just a tiny bit dry. So on my second attempt, I wrapped the sandwich in a damp paper towel and it microwaved MUCH faster and the bread stayed nice and soft. I split these with my family so we could all offer an opinion, and all of us agreed they were really very good! Nice flavor and texture, good combination of the smoky "bacon", savory, eggy chickpea patty and tangy tomato spread! 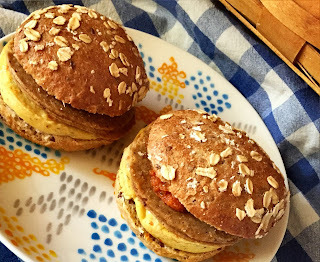 The Flaxbread is nice and hearty, and stands up to the filling really well!They are smaller than the standard American fast-food English-muffin breakfast sandwich, more like a slider, but a million times better for you, WAY more nutrient dense, and I think just as filling! My boyfriend of the hearty appetite said he'd eat two for breakfast, at least (ha!) and my teen daughter said one was plenty filling. Your mileage may vary. These will be available in stores like Whole Foods, starting October 1st.